If you’re looking for lead magnet ideas you’ll also find it quite valuable to first learn the basic features of the perfect lead magnet. After all, what would a good lead magnet idea be worth if no one wanted to download and implement your solution? Putting together the perfect lead magnet to persuade website visitors to join your email list can be a roadblock for online entrepreneurs, bloggers and service providers. Questions like “What do I offer?”, “Will people read it?”, “How long should the lead magnet be?” often cause confusion to business owners who end up stalling instead of growing their online audience. In this post, we’ll show you how to create the perfect optin offer. We will break it down into 5 simple traits that will make your lead magnet irresistible. But first, let’s explain what a lead magnet is all about. 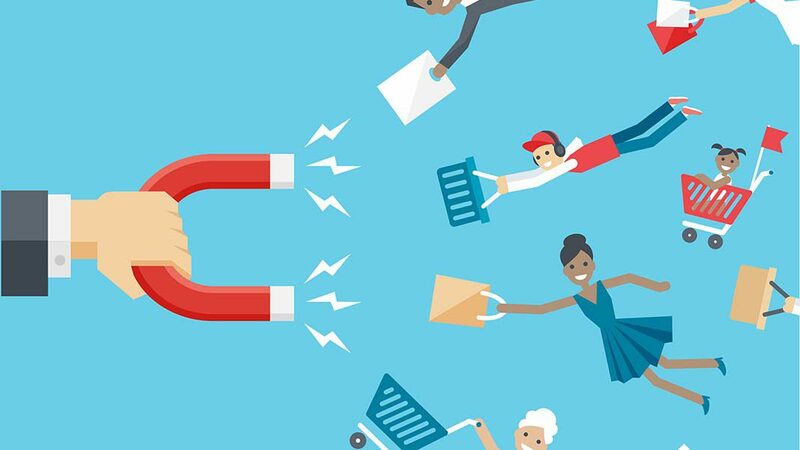 Those who are just starting out with online lead generation may not be familiar with what lead magnets are and how they can help them boost their lead generation process. A lead magnet is some freebie you’re giving away in exchange for a person’s email. In other words, if you’re looking to subscribe a website visitor to your mailing list, you need to have some kind of incentive in place. Such an incentive, namely a lead magnet or, otherwise called, an email optin offer, could be a report, a video, a cheat sheet, a checklist, a template or practically anything else that your audience will want to get their hands on. A perfect lead magnet will be the ethical bribe for people to give up their email, and we’re going to share 5 important tips on creating a high-converting lead magnet. Anyone can write a report titled “7 Ways To Double Your Revenue,” or “8 Conversion Hacks For Your Website.” Take 5 minutes and cruise around online and you’ll be surprised how many similar titles you’ll find. The key is to be specific – to let a prospect know exactly what they’re downloading – and make sure that the material is unique enough that the only way for them to consume it is to actually go through the lead magnet! Because let’s face it… If your lead doesn’t at least look at your stuff, they sure won’t be on your list for very long! How many times have you downloaded something and never opened it up? Be specific. Deliver value. Get the lead. What does a super specific lead magnet title let you do on the thank you page?! That’s right… If someone just downloaded a report titled, “7 Secret Persuasion Tricks To Increase Webinar Conversion,” what do you think they’re interested in? 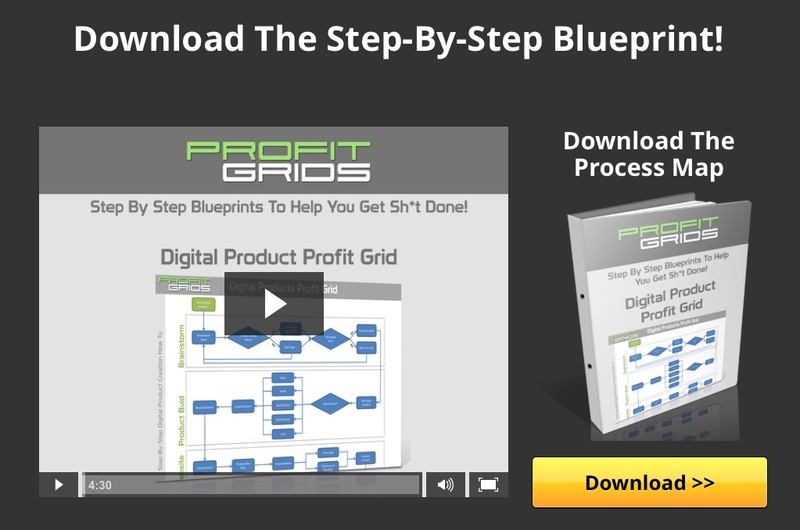 Welcome to the magic of creating sales funnels. And, by the way, you want to place that offer on a beautiful page, right? 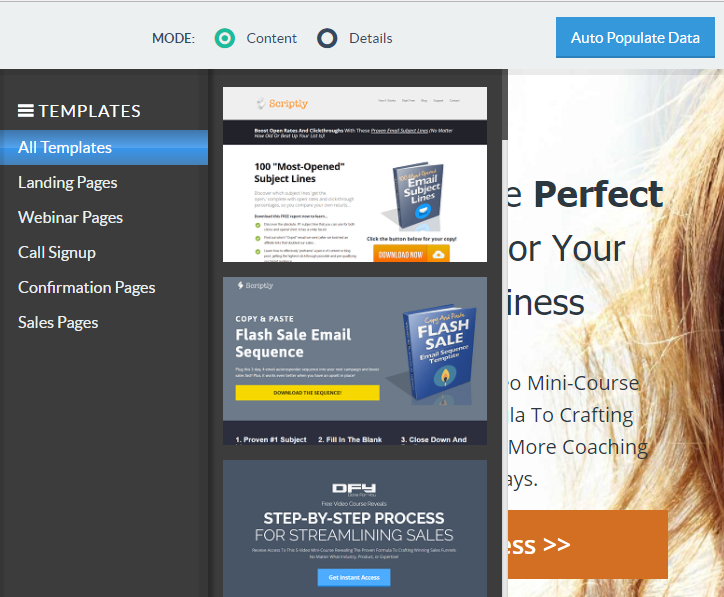 With Scriptly’s drag-and-drop page builder, you can create amazing optin pages in seconds. Watch this quick video to find out how fast it can be to create a bold, high-converting optin page for your lead magnet. Not only is it easy to create the layout, but also you’re given the option to populate web copy automatically so it matches your ideal customer–we’ll say more about that further down this post. The perfect lead magnet needs to provide a clear solution for a problem a particular audience faces. Put simply, you don’t want to go vague with the content of your optin freebie. For example, “How To Make Money Online” sounds too generic, doesn’t it. It doesn’t let the reader know if it’s just for them, if it’s something they can do and if it will get them results. Although the idea is big and interesting to most people, the headline is so incredibly vague. Such lead magnets are not targeted to a specific niche and they don’t present a crystal-clear solution. On the flipside, instead of saying “How To Make Money Online” you can use a title such as “How To Use The World’s Leading Freelance Marketplace To Make Up To $10,000 A Month As A Beginner Web Designer”. Now, that is a lot more specific. And of course, you can rephrase the title if you want to remove earning claims or mention the name of that specific freelance marketplace—which is UpWork. See how instead of tackling the entire subject of making money on the internet, we have narrowed it down to a specific topic that gives a solution to a specific audience—beginner web designers who want to make money freelancing. And here’s an example of a specific freebie offer in a totally different, but well-defined, niche. Let’s see another example of a bad lead magnet. 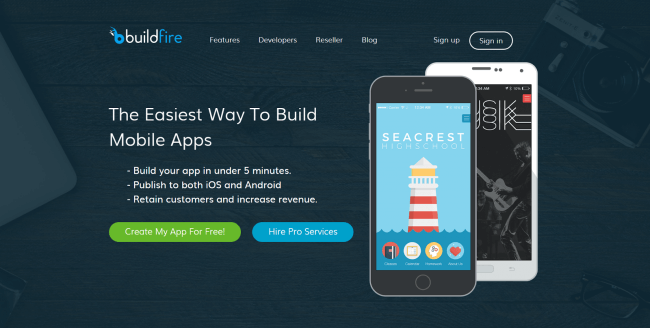 “How To Speed Up Your Website”. Who is this for? A solopreneur? A blogger? A developer? Is it good for a blog? How about a large ecommerce site? Is it suited for HTML websites or WordPress only? These are only few questions that a potential lead can have before they decide to download your lead magnet. You get the picture… And because the headline is too vague a lot of visitors will leave your site without taking action. Transform that into “The Non-techie’s Guide To Doubling The Speed Of Your WordPress Blog” and you have a specific topic for a laser-targeted audience. Keep in mind, when brainstorming on the perfect lead magnet topic, that you need to abandon the idea of a big overarching market. It’s hard for some people to do that because they feel like they will close fewer deals with clients. But the truth is that narrowing down to a particular niche will help you create high-converting lead magnets, better products and generate more sales because your marketing messages will speak to these people’s needs. An effective lead magnet would need to give a big promise and sell people on a big idea. You don’t want to promise that your lead magnet will deliver on a ton of things. You want to show your prospect that, after they consumed and implemented the content of the optin offer, they will have arrived at a specific, measurable result. At the same time, you’re inspiring your audience to believe that the solution is totally possible. You want to give them hope, examples, and strategies to help them believe they can get the same good results. You’re not giving necessarily the whole “how to” process and you’re not giving up your expertise. You don’t need to go and create a 70-page ebook on the entire subject–in fact, you shouldn’t be doing that. All you need to do is focus on one basic result you want your potential customers to get. One thing that will demonstrate that your solutions will work for them. If you were to make a lot of promises, your leads wouldn’t have the time or energy to implement them, and, in turn, they wouldn’t get results. Then, they will be under the impression that your methods don’t work. 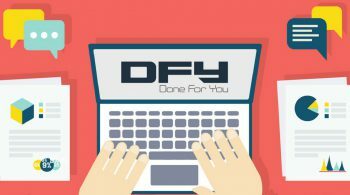 If you take our original example of “The Non-techie’s Guide To Doubling The Speed Of Your WordPress Blog”, the content of your lead magnet could be about this: How to install a free plugin from the WordPress repository, set it up with two or three clicks, and how to measure their blog speed before and after installing the plugin. Give them images, examples and practical tips along the way. When you limit the promise to a known, specific result it’s more likely that the reader will actually implement your ideas and be happy with the outcome. Always keep in mind that people are looking for results; that’s why they’ll google something like “how to speed up my blog”. They want to find a DIY way to get the best result possible. Answer their question in a specific way, and you have your perfect lead magnet. Give people measurable outcomes, like percentages, numbers or timeframes, e.g. such as to accomplish something within 1 hour or within 3 days, and so on and so forth. Whatever is most appropriate to your offer. Build that specific result into the title of your email optin offer to attract more people who want fast, measurable results. This takes us to the next point, which is that the perfect lead magnet will give your audience instant gratification. You know as well as we do that patience and attention span are constantly diminishing due to a ton of information we receive every day, mostly on the internet and on our smartphones. We all spend hours consuming content and we all feel more often than not that we need quick and easy solutions to our problems. We won’t judge it but it’s a fact that people are accustomed to immediate gratification on social media, and that fact has altered our behavior. Instead of resisting the trend for instant gratification, what you should do instead is to use it to benefit your online business. For example, the following offer promises results in under 5 minutes. This characteristic of a perfect lead magnet goes hand in hand with the previous point we talked about. The major difference with this is that you don’t want your lead magnet to deliver on something huge. To build your list, you don’t need to create anything big, like an ebook on how to create a complete sales funnel from top to bottom. Such a monster tutorial will take time and effort to implement, so it won’t give people immediate gratification. Think for a minute; When people land on your page they are warm already. That’s because they’ve either searched on Google or clicked on your ad. They are so in the mode of finding an answer right now! Then, they go enter their email to download your seemingly perfect lead magnet. They feel like they have the solution in hand and it’s only a matter of seconds before they read all about it. They are now even warmer and in the mode of taking action. They download and open your lead magnet. They are curious to start consuming the content. This is exactly when they need to feel that your solution is something they can implement right away. They also need to believe that you will deliver on your promise. So, you want to move the new subscriber down the pathway of belief right from the very beginning. You want to amplify their hopes that they can get the result they crave. They need to believe that a solution is actually possible. Again, mind that you can’t solve all of people’s problems with one PDF. What you want instead is to take them one step further to transforming their current state to a ideal new state. You want to have them realize that they have actually took the first important step, that they made that headway. Simply put, you want to give your new lead a quick win. You want to give them a link to go to your site and see more of your services, share a testimonial about you or just tell you about their results. This way they will acknowledge the fact that your methods work, and this can spark a conversation. This perfect lead magnet is going to help your business when people get results and engage with you because they are now going to think of you when the need similar services or solutions. We have kind of touched on this but it’s important to stress this idea because it is essential to a perfect lead magnet; You need to make sure that your email optin offer can be consumed in less than 30 minutes (ideally in less than 15 minutes) and on any device. Long videos, 30-day challenges, or 70-page ebook won’t do the magic trick. It’s not necessary to have extensive introductions and conclusions. No need for much detail about the topic. 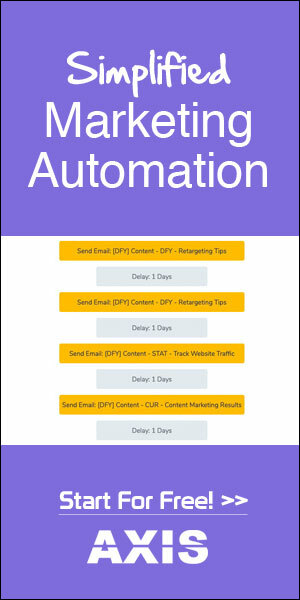 You want your leads to be able to consume your content fast, on their computer or mobile device and be able to start seeing results quickly. Use images or screenshots that demonstrate what you want to explain. This will help you make your paragraphs shorter and easier to read. Checklists and cheat sheets are preferable over the typical ebooks because the user can quickly scan the whole content. Other ideas for perfect, easy-to-consume lead magnets are resource lists, email swipes, newsletter templates, lists of ideas, short screencasts or audio files. You don’t need to impress people with size because the longer your lead magnet the fewer people will read it anyway. If you definitely want to give them more content, you can them direct them to an additional resource from within the free ebook. Now that these leads have entered your funnel you can communicate with them and provide them as much content as you want. As we mentioned before, internet users are overwhelmed with information. 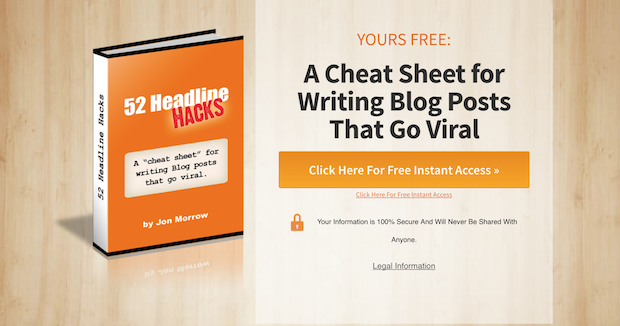 You need to keep that in mind if you want to publish the perfect lead magnet out there. You don’t want your work to be another PDF collecting dust on the user’s hard drive. Your top priority is to get people to download the lead magnet, and your next goal is to motivate them to instantly consume your content, instead of filing it on their computer. If they leave it for later, that later will most likely never happen. Marketers say that videos are products with a high perceived value compared to ebooks. That makes sense because everyone understands that a video requires equipment and technical know-how while an ebook can be created using any word processor. Of course, perceptions change over time as technology and marketing tactics evolve. A perfect lead magnet doesn’t necessarily need to be a video but it needs to have a high perceived value. This doesn’t have to do with a dollar amount; The perceived value is completely different that the price. In terms of how users perceive it, the lead magnet needs to seem valuable because they will expect it to solve a nagging issue. Some marketers rely on psychology when they say that their ebook is “Valued at $17, now available for free.” In most cases, this is a marketing trick because they never really sold the ebook for that price. They’re just amplifying the perceived value. You don’t need to play games like that though; you can increase the perceived value of your perfect lead magnet by stressing the benefits of using it. If you can convince your targeted audience that you can give them a reliable solution with this lead magnet, then you have a winning case. To accomplish that you need to know exactly who your ideal customer is. Paint the picture of your customer avatar as clearly as possible. Scriptly’s customization features will help you do that. With Scriptly, you can create as many customer avatars as you want, understand their situation and find the big concerns that they have so you can then build better lead magnets and better optin page copy. Then, when you use Scriptly to create a drag-and-drop optin page, you have the option to press a button and auto-populate your page with sales copy which is customized for the chosen avatar. In essence, when you’re speaking to a well-defined customer avatar you will know the single biggest concern they have. You can create an effective lead magnet to solve that. You can promote that lead magnet by writing good landing page copy that increases the perceived value. 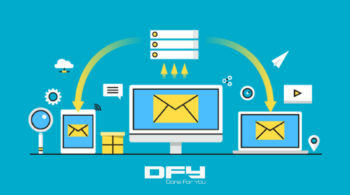 Once you start getting leads, then you can start having Scriptly write your emails for you! The ‘report’ is the standard lead magnet for good reason – it works! In fact, we’ve found that oftentimes a report or a guide will get cheaper, higher quality leads than a video ever will. You MUST, MUST, MUST deliver value. There should be at least a little bit of bonding that takes place in the report, so your new lead gets to learn a little more about you! A good length for a free report is 8 to 12 pages, normal spacing and typefaces. Most important of all - it needs to focus on ONE specific, clearly identified problem! And... Make sure it contains some kind of call to action at the end of it! 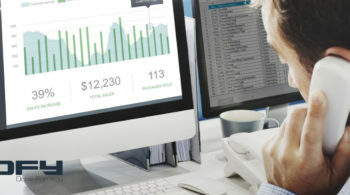 With reports, the more clearly you state the benefit, the better your conversions and lead costs will be. I love process maps, because they cut through a lot of BS real quick. More to the point – your prospects will love process maps even more! In a lot of instances, the sequence of events is what trips people up when they’re trying to accomplish a certain task, be it setting up a website or editing a perfect black and white photo. Both of those outcomes lead to more sales for you, in a very short amount of time! Software was what I was meant to do with my life, and I’m just now finding that out. 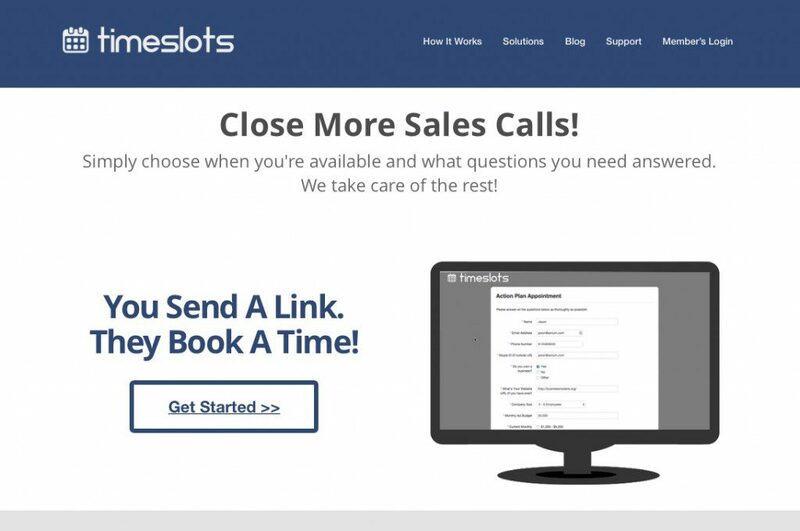 One of our software applications is TimeSlots, a sales call scheduling software… It has a 14-day free trial. 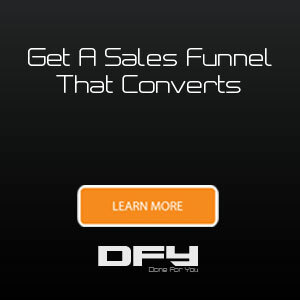 I don’t need to tell you how awesome that is for getting us leads! The beauty of software is that it’s core function is to solve a problem for users, instantly. Plus, there’s an immediate gratification element to it that can’t be matched. The best way to turn your software into a lead magnet is to have a ‘Free Trial’ set up. They get full access to all of the features of your software, and after 7 days or 14 days they need to join to keep using it. 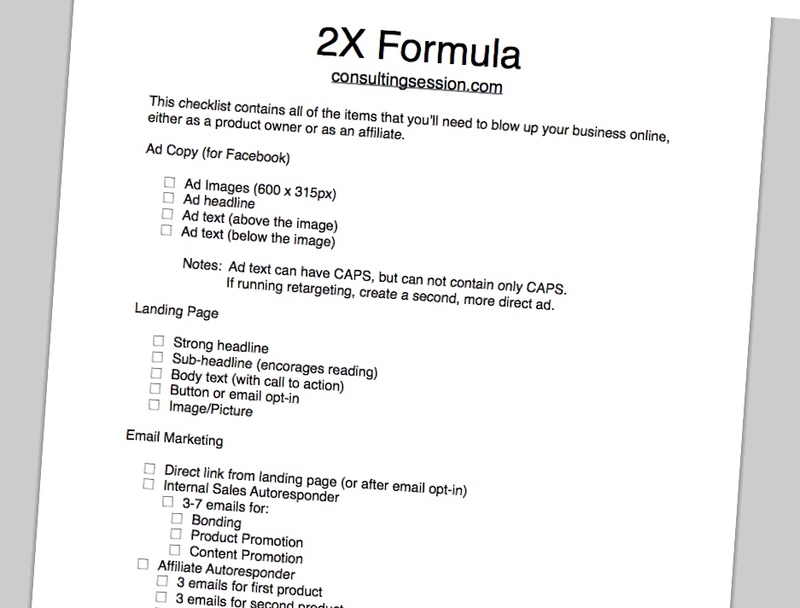 The 2X checklist is what we gave away on some of our live webinars. With a well thought out checklist, you can demonstrate that you know the material inside and out, and also point out things that your prospect might be missing! 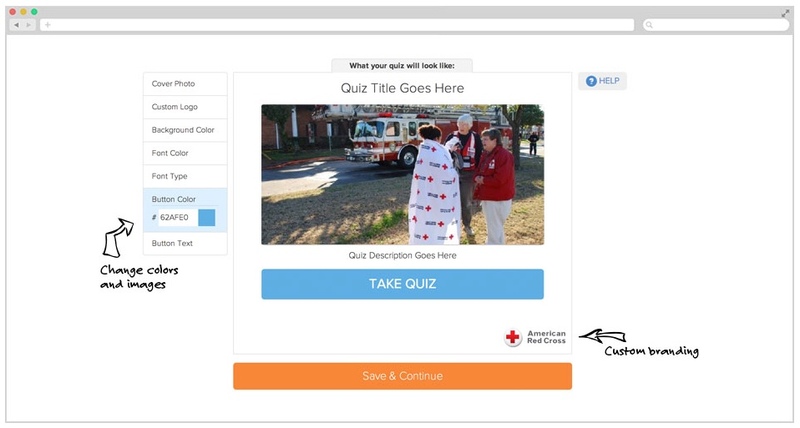 This is great for getting them to raise their hand and say that they need your help! One of the ways that a lot of marketers try to get leads is to give access to a ‘free video.’ From experience, I can tell you that sometimes it works… And sometimes it doesn’t. If you’re demonstrating something that’s highly visual, like training a dog, swinging a golf club, adjusting a camera for the best portrait, or building something out of 2×4’s, then video is a good medium to share that content. If you’re doing something that’s NOT visual, like talking about marketing strategy, explaining the big benefit of life coaching, or teaching someone how to ward away panic attacks – a video lead magnet is a bad way to go. 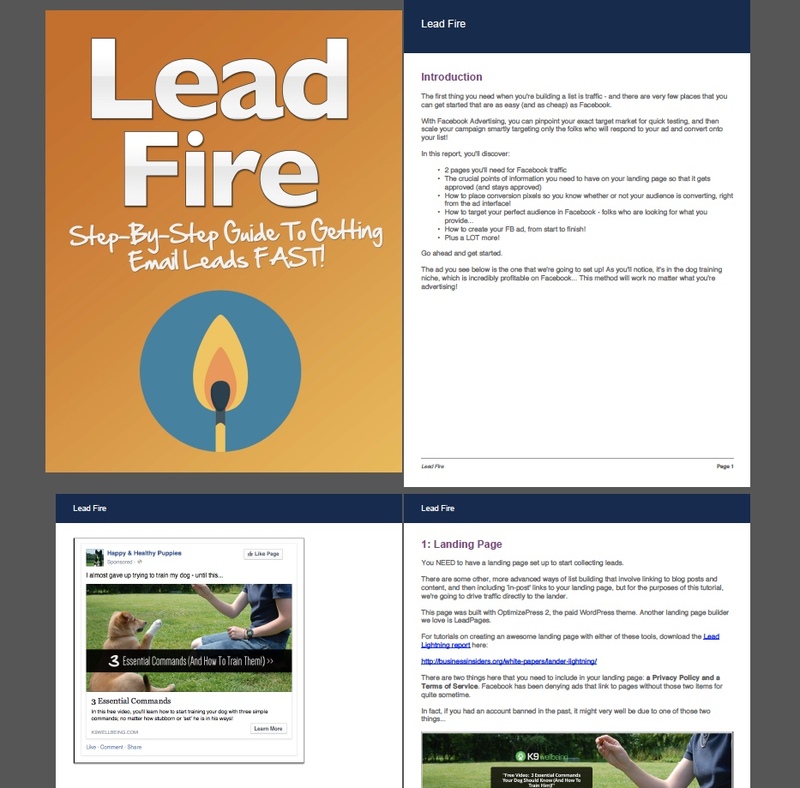 I’m a big fan of point and click tutorials for teaching like we have in Lead Fire – and they make excellent lead magnets. In fact, I can’t tell you how many people have emailed me saying the printed them out and rely on them every time they need to set up a new campaign or a new website. As further evidence of this, one of the biggest tutorial sites online is Envato Network’s TutsPlus. For years, they’ve put together incredible tutorial sites, and now they’ve got so much content that they’ve put a big ecourse kind of wrapper around it, making it a HUGE challenger in the digital course space! And finally, quizzes and surveys, like what we have at Askly. What’s funny is that quizzes and surveys have been around forever, and marketers are just now touting them as the ‘best way to engage users’ because you can get feedback from your readers a bit differently and immediately segment them into buckets. Years ago, we called this list segmentation… When someone fills out a survey and selects (A) as their choice, they get put into one autoresponder. If they select (B), they get put in another autoresponder. That’s the crux though… When you use a survey as a lead magnet, your lead conversion will most likely drop… But your engagement will be a lot higher, meaning you’ll have better quality leads! It’s worth A/B testing. I’ve seen campaigns that use surveys so effectively that it doubles optin rates. I’ve also seen campaigns where conversions were below 10% (which is dismal!) It’s all in how you set them up! So, let’s put in some time on getting your lead magnet set up… It’s pretty easy and once you’ve done it a time or two, you can whip them out in record time! 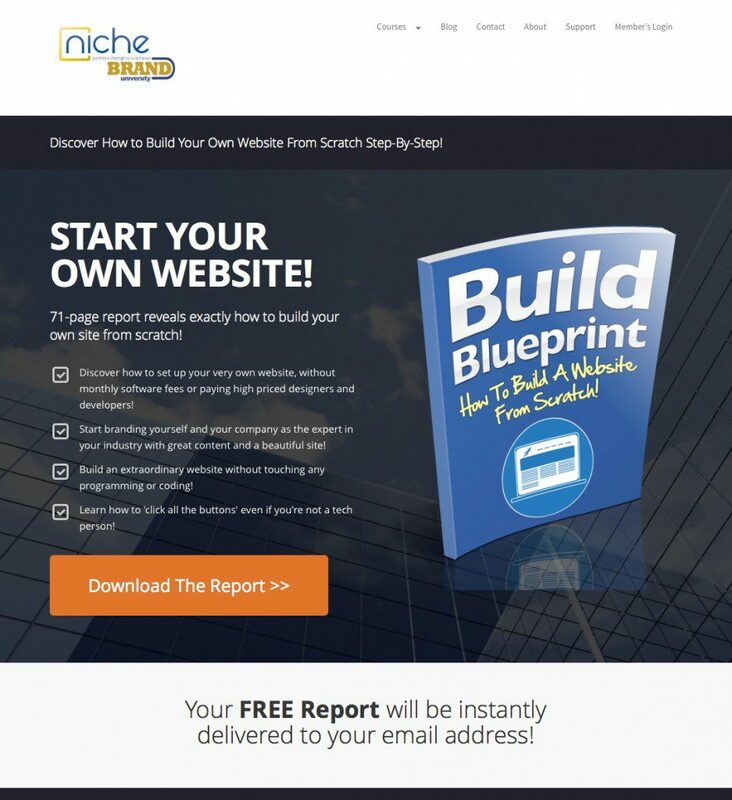 Special Reports or Guides get great for generating leads, they’re easy to create, and you’ve already got all of the software that you need to get one set up on your computer. Plus, we’ve found that oftentimes a report or a guide will get cheaper, higher quality leads than a video ever will. With reports, the more clearly you state the benefit, the better your conversions and lead costs will be from paid traffic. 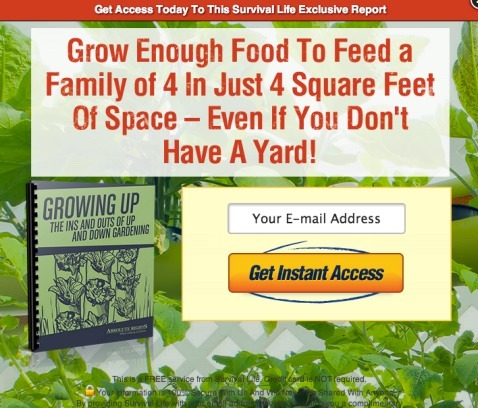 … And you want to use your lead magnet as a way to position you and your products correctly, since you’re going to be selling to these leads through email! A friend of mine, Ryan Deiss, says that lead magnets should be ‘splinters’ of what you’re selling. In other words, they should be small, little sections of the bigger product. If you have a course on real estate investing, your lead magnet might be a report on "3 Ways To Find Cheap Investment Opportunities Using Free Tools." If you have a coaching offer on webinar marketing, you have a lead magnet titled, "7 High Intensity Closing Strategies That'll Increase Webinar Conversions By 120 Percent." If you've got a brick and mortar shop - a car dealership - your report might be "5 Things To Look For That'll Maximize Your Resale Value." In each of those examples, the lead magnet is a small, microscopic part of the larger, overall picture! A side benefit is, since you’re just giving away a piece or a splinter of a bigger picture, your lead magnet will be ultra-focused and easily understood by cold traffic… Which means your conversions will be through the roof. It doesn’t matter to me which one you use. I’m a Mac guy and prefer Pages, but it’s completely up to you. From a functionality standpoint, they each do the same thing. In terms of style and logistics, just use the default settings for margins and spacing. Don’t worry about making the font bigger or changing the style. Include an intro section. Talk about what's going to be in the report, introduce yourself to your new reader, and make sure to talk about why what they're about to read matters. Include subheadings. Break up longer sections of your lead magnet into sections and give them sub-headlines. This encourages consumption. We’ve found that your lead magnet reports should be between 8 to 12 pages long… That might sound like a lot, but it goes by fast! And really, the title of your lead magnet is going to give you everything you need to beef up that Report Core section. If you’re writing a report titled, “7 High Intensity Closing Strategies That’ll Increase Webinar Conversions By 120 Percent,” simply devote a page to each of those 7 strategies and your golden! You want to give your reader the opportunity to read the report and then click through to continue deeper into your sales funnel. Usually, the very last section in our reports is a “What’s Next?” section. In that section, I invite a reader to continue on the journey by signing up for a webinar, filling out a strategy session form, or watching a video. In each of those examples, they continue deeper on the path. The person who opts-in, downloads your report, then reads through the entire thing and clicks through a link is an extremely hot lead. They liked you. They liked what you had to say. And they’re willing to take the next step with you – which means you’re about to generate some revenue! These are your buyers, which we talked about yesterday. After you include your call to action, it’s time to pretty up your report a little bit. Typically, what I’ll do is look for Creative Commons or Royalty-Free images that correspond to the sections of my report, and drop them in. In Step 2, we listed 3 different word processors you can use to write your report… Each of them has the functionality of exporting your document as a PDF. PDF’s are the standard when it comes to reports. They lock the editor so that a reader can only read what you wrote, and Adobe Reader (the program that opens up PDF’s) is on almost every computer known to man. Plus, your more technologically proficient readers will be able to put their PDF on their iPad or Android tablet, and consume your content from there. Not to mention, with Amazon Kindle and iBooks getting so popular, ebooks and digital files have more value associated with them. That’s a good thing in the mind of your prospect! 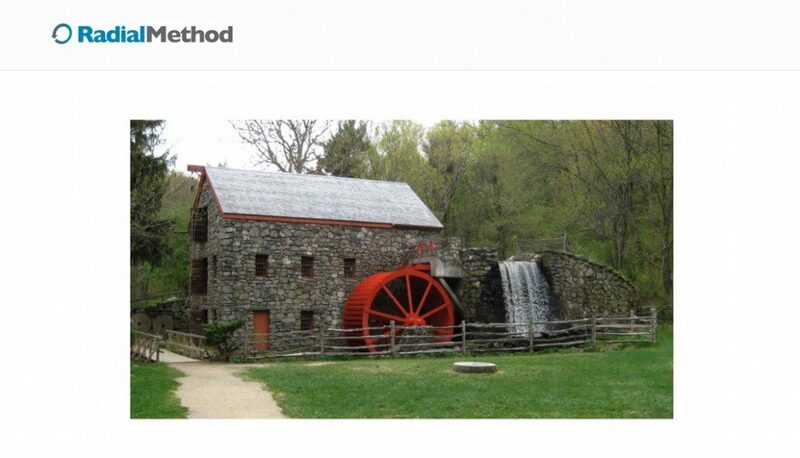 The last step is to upload your PDF online somewhere, so you can share it by posting a link. 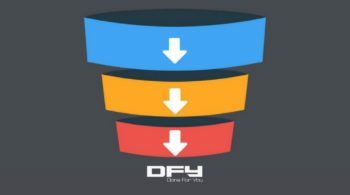 There are a lot of ways to do this… You can upload your PDF to Dropbox.com and share it with a public link. You can upload it to Google Drive and give it a public link. Or, my favorite, you upload your document as a media file to your WordPress website and get your link from there. After you get the lead, what do you do? Do you sell them something? Do you give them a bunch of free content and build a relationship with them? The best answer – both! Ready to craft your next lead magnet? So these are our top 5 tips for creating the perfect lead magnet. Put them to use when you’re in the process of creating a new freebie to entice subscribers to join your list. You can also implement these practical ideas to transform your existing low-performing lead magnets to new exciting lead-grabbing offers. Now, creating the perfect lead magnet sounds a lot easier, doesn’t it? And as a parting piece of advice; don’t forget to include a call to action (CTA) in your lead magnet. It should be a CTA that helps the new lead go deeper into your sales funnel to eventually become a customer. So, as an example, a CTA could revolve around a paid product that would complement the freebie at hand. If you decide to use a CTA in your lead magnet, make sure you don’t reverse the traction they’ve already gained. You want your readers to implement your solution and get results. And, you can still email them anytime in the future to promote your products. If you’d like to look into having us set up a lead generation system for you, go ahead and tell us a bit about your business here!